Lalu Yadav was held guilty by a trial court and sentenced to 5 years in jail in a similar case in 2013. Ranchi: Right after Lalu Yadav and 15 others were found guilty of corruption in the fodder scam case by a CBI court in Ranchi yesterday, the BJP hit out at the Congress, an ally of Mr Yadav, and called the UPA an "alliance of corruption". His conviction gave a fresh boost to the BJP's attack on the Congress and its allies dampened in the last few days with the 2G scam and Adarsh Society scandal verdicts. Former Bihar Chief Minister Lalu Yadav was convicted in a corruption case over the embezzlement of Rs 85 lakh in government funds in the 90s. Mr Yadav was earlier held guilty by a trial court and sentenced to five years in jail over a similar case in 2013. However, the latest post on Mr Yadav's Twitter account said, "Truth can be made to appear as a lie, as ambiguous or a half lie by concerted onslaught of bias driven propaganda. But blurred layer of bias and hatred will still be removed, come what may! In end Truth will win." Ramping up the attack, Congress leader Manish Tewari demanded to know why was the Srijan scam not being investigated? "Why are there different strokes for different folks? We have always said the law should take its course... (but) the central investigating agencies are acting like a pet performing parrot," he added. Claiming that the UPA's "alliance of corruption" has been exposed, union minister JP Nadda quashed allegations of a conspiracy by the BJP behind Mr Yadav's conviction and reminded the opposition that the cases were pursued when the UPA was in power. 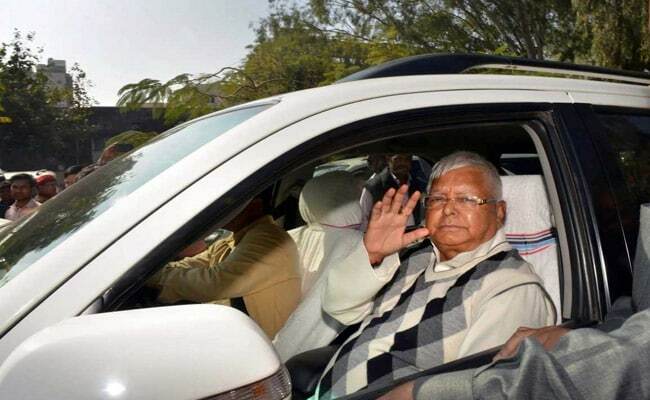 "It has been proved that Lalu Yadav indulged in corruption and the decision has been given by the court. How does the BJP figure in it? Over three years after it was ousted from power (UPA), we still see one case after another coming out and courts are indicting and convicting them. So, this itself speaks of the deeds done by them," the senior BJP leader said. Earlier in the day, BJP ally and Union minister Ram Vilas Paswan also criticised Mr Yadav for his "involvement in corruption whenever he was in government, including as the railway minister, but was (now) 'lecturing' others". BJP leaders have also cited the recent conviction of former Jharkhand Chief Minister Madhu Koda, who came to power in an alliance with the Congress, in the coal scam case to attack the opposition party.